This fund report has been provided by Kepler Trust Intelligence which is an online research hub for private investors. Each report is written by one of their team of qualified and experienced analysts who specialise in the sector. The report is designed to provide a clear, detailed qualitative overview of the investment trust, examining all of its key features in detail to help investors make an informed investment decision. This report provides information to private investors. Kepler Trust Intelligence does not provide advice in relation to investments and you are responsible for deciding whether an investment is suitable for you. In doing so, please remember that past performance is not necessarily a guide to future, the performance of funds is not guaranteed and the value of your investments can go down as well as up, so you may get back less than you invest. Investors acting on the information in this report do so at their own risk and AJ Bell does not accept liability for losses suffered by investors as a result of their investment decisions. 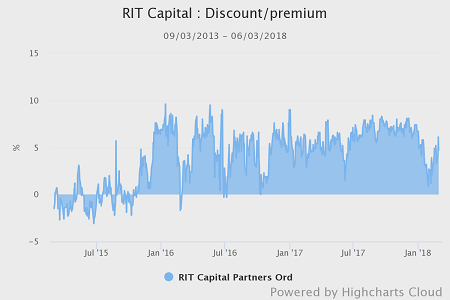 RIT Capital Partners is a highly differentiated multi-asset investment trust which aims to deliver returns in excess of RPI +3% over the longer term. It offers exposure to a wide range of interesting opportunities around the globe, and benefits from scale and an association with the Rothschild family, with a highly-resourced management team behind it. The large stake owned by the Rothschild family means the interests of the board, which is led by Lord Rothschild are aligned with shareholders – with a clear focus on preserving capital invested, not just growing it. The £2.8bn trust is a constituent of the AIC Flexible Investment sector and differentiates itself by being entirely benchmark agnostic. It places a high degree of importance on capital preservation and does not aim to be invested in equities all of the time. 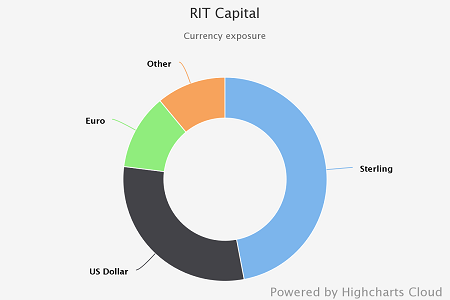 RIT Capital Partners invests globally in a wide range of assets, including listed equities (taking both long and short positions), unquoted companies, absolute return strategies, credit and real assets (or physical assets, such as property and commodities). The trust invests in both direct securities and externally managed funds, with the portfolio constructed on a thematic basis. In addition to a multi-asset approach, multi-currency exposure is a major feature of the portfolio, which held two thirds of its exposure outside sterling – mostly in dollar – during the melee of the EU referendum. Currency was the biggest single contributor to performance in 2016 as a result, but hindered returns over the course of 2017 as sterling rebounded. The trust has since then increased its exposure to sterling, which now makes up 47% of its exposure. The trust has a long track record of outperformance and capital preservation, with the latter being a major theme of the trust’s marketing, and since inception (1988), the managers claim to have participated in 76% of up moves in the equity market, and 39% of market down moves. This performance profile is highlighted over the past 20 years to the end of February, with RIT Capital Partners having delivered annualised returns of 9.4% per annum (compared to 5.4% from the FTSE All Share), but with a maximum drawdown – or the most an investor could have lost if they had bought and sold at the worst possible times during that 20 year period – of 24% (compared to 42% from the FTSE All Share). Capital preservation is once again the name of the game as the team have noted their increasingly cautious outlook, with high equity market valuations, changing monetary policies and geo-political tensions all meaning the managers do not believe now is an “appropriate time to add to risk”. The trust has a strong following among investors who wish to shelter their wealth and this lends support to demand for the shares. As at 6 March 2018 the trust was trading on a premium of 4.7%. The trust aims to offer a global exposure to diversified asset classes – bonds, equities, cash, gold etc – and different investment themes. It differentiates itself by being entirely benchmark agnostic, by the active use of currency exposure, and also not aiming to be invested in equities all of the time. For example, the portfolio was 55% invested in equities (including long-only equity funds) in 2015 but, by the end of May 2016 was down to 39% in long equities, helping to insulate the trust from the chaos which followed the EU referendum in the UK. The managers are deeply sceptical about the sustainability of the current bull market, already the second longest since the end of World War Two, and as a result quoted equity remains a low weighting overall at 35% of the portfolio. In the trust’s most recent interim report, released in February 2018, Lord Rothschild highlighted unpredictable US policy, Britain’s ongoing torturous negotiations with the EU, the growing risk of conflict in various theatres, and rising nationalism within Europe as causes for concern in a world where the lessons we should have learned about debt in 2008 seem not to have sunk in. 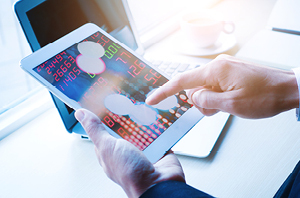 Outside of its long positions in equities, the trust shorts stocks, owns stakes in unquoted companies and offers exposure to absolute return strategies, credit and real assets such as gold. The trust’s second largest exposure, absolute return and credit – including via funds – now makes up 24% of the portfolio, having increased from 14.2% at the start of 2017. Hedge funds make up 21% of the portfolio, while private investments make up around 22% of the portfolio in total, via funds and direct, the former largely being mature, cash generative investments. Private investments are identified via the trust’s unique network – a good demonstration of which was its 35% stake in Rockerfeller made in 2012; an investment not on the table for traditional private equity investors. In currency terms, the trust has reduced its heavy exposure to assets denominated in US dollars (60% in August 2017) and now sterling is the dominant force in the portfolio, at 47% of NAV – a significant shift from the 25% exposure at which sterling stood in the early part of last year. The managers increased their sterling exposure significantly in the first half of 2017 after it reached a multi-year low versus the dollar. The dollar has moved down to second place at 29% while the rest of the currency exposure is split between much smaller weightings in Euro, Renmimbi, Yen and Swiss Franc. The portfolio – with its various asset classes and currencies – may seem complicated but the process and the ‘silos’ within it can better understood by breaking them down to what the team call their “six cylinder approach” to investing. 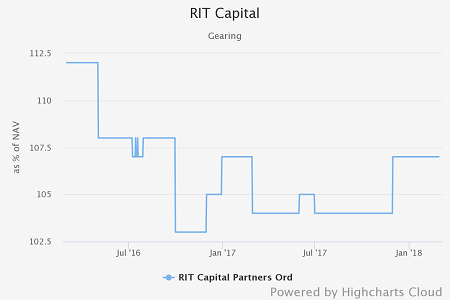 RIT Capital has used gearing opportunistically in the past and has seen gearing increase in the last year, moving from 4% at the start of the year to around 7% at the end of February according to data from Morningstar (or 13% including cash and cash equivalents according to RIT Capital’s latest annual report). 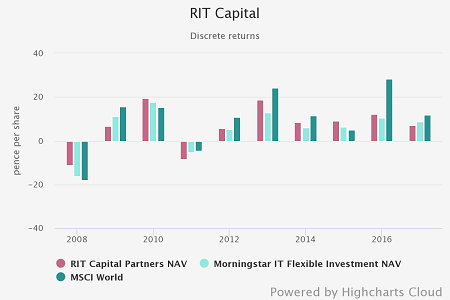 RIT Capital has a long track record of outperformance and capital preservation and, while it regularly underperforms the MSCI World index during strong positive periods, the managers’ success in missing the troughs has added up to a formidable cumulative return in share price and NAV terms. Indeed, capital preservation is a major theme of the trust’s marketing, and since inception (1988), they claim to have participated in 76% of up moves in the equity market, and 39% of market down moves. 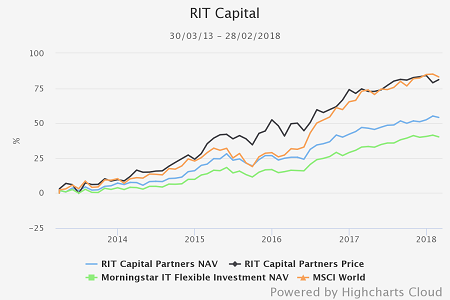 This performance profile is highlighted over the past 20 years to the end of February, with RIT Capital Partners having delivered annualised NAV total returns of 9.4% per annum (compared to 5.4% from the FTSE All Share), but with a maximum drawdown – or the most an investor could have lost if they had bought and sold at the worst possible times during that 20 year period – of 24% (compared to 42% from the FTSE All Share). Examination of discrete performance further highlights this trend, as the trust has held up well during falling markets, particularly in 2008, when the trust’s NAV fell 11% compared to a 20% fall from global equities and a 16% loss from its peer group average. As one might expect, however, the trust’s cautious approach and focus on capital preservation comes at the cost of upside when markets are in high spirits, particularly if the managers don’t share that euphoria. Last year, in particular, was a case in point with the index up by more than double the amount delivered by the trust. The board intends to pay a solid dividend and has an aim to increase it above inflation, or maintain it at the very least. In the latest annual report, the board announced that the dividend for 2018 will be 33pps, up 3.1% on the previous year. It is the trust's policy to pay this from capital. 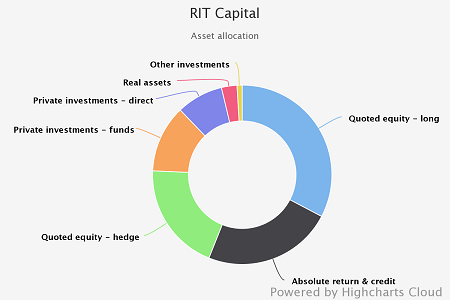 RIT Capital is internally managed. The team have a variety of incentive plans, linked to NAV performance relative to the benchmarks over the short term (1yr) and the total shareholder return over the medium term (3yr) which aligns them to shareholder’s interests. The annual (short term) incentive scheme is capped at 0.5% of NAV. Since 2012, the trust has been managed by an executive committee with day to day responsibility for running all aspects of the trust and its portfolio, and is comprised of four members. The investment functions of the trust are led day to day by investment director Ron Tabbouche (ex GAM) and CEO Francesco Goedhuis (who has worked with Lord Rothschild since 2010). Lord Rothschild chairs the investment committee. The trust has no formal discount control policy. However, it has a strong following among both private and professional investors and this, along with its track record of protecting capital, has meant demand for its shares has soared during recent turbulent market and political conditions. It traded on a premium for the large majority of 2016 and 2017, but saw the premium diminish slightly in the early days of 2018. Since the recent bout of volatility kicked in the premium has begun to climb again. The stated OCF for the trust is 0.66%. Internal performance and incentive fees are capped at 0.75% of NAV, or 0.25% if the NAV has declined in any year. Material produced by Kepler Trust Intelligence should be considered a marketing communication, and is not independent research. Please see the important information by following this link. Kepler Partners is not authorised to make recommendations to Retail Clients. This report is based on factual information only, and is solely for information purposes only and any views contained in it must not be construed as investment or tax advice or a recommendation to buy, sell or take any action in relation to any investment. This report has been issued by Kepler Partners LLP solely for information purposes only and the views contained in it must not be construed as investment or tax advice or a recommendation to buy, sell or take any action in relation to any investment. If you are unclear about any of the information on this website or its suitability for you, please contact your financial or tax adviser, or an independent financial or tax adviser before making any investment or financial decisions. The information provided in this report is not intended for distribution to, or use by, any person or entity in any jurisdiction or country where such distribution or use would be contrary to law or regulation or which would subject Kepler Partners LLP to any registration requirement within such jurisdiction or country. Persons who access this information are required to inform themselves and to comply with any such restrictions. In particular, this report and its contents are exclusively for non-US Persons. The information contained herein is not for distribution to and does not constitute an offer to sell or the solicitation of any offer to buy any securities in the United States of America to or for the benefit of US Persons. This is a marketing document, should be considered non-independent research and is subject to the rules in COBS 12.3 relating to such research. It has not been prepared in accordance with legal requirements designed to promote the independence of investment research. No representation or warranty, express or implied, is given by any person as to the accuracy or completeness of the information and no responsibility or liability is accepted for the accuracy or sufficiency of any of the information, for any errors, omissions or misstatements, negligent or otherwise. Any views and opinions, whilst given in good faith, are subject to change without notice. This is not an official confirmation of terms and is not to be taken as advice to take any action in relation to any investment mentioned herein. Any prices or quotations contained herein are indicative only. Kepler Partners LLP (including its partners, employees and representatives) or a connected person may have positions in or options on the securities detailed in this report, and may buy, sell or offer to purchase or sell such securities from time to time, but will at all times be subject to restrictions imposed by the firm’s internal rules. A copy of the firm’s conflict of interest policy is available on request. Past performance is not necessarily a guide to the future. The value of investments can fall as well as rise and you may get back less than you invested when you decide to sell your investments. It is strongly recommended that Independent financial advice should be taken before entering into any financial transaction.